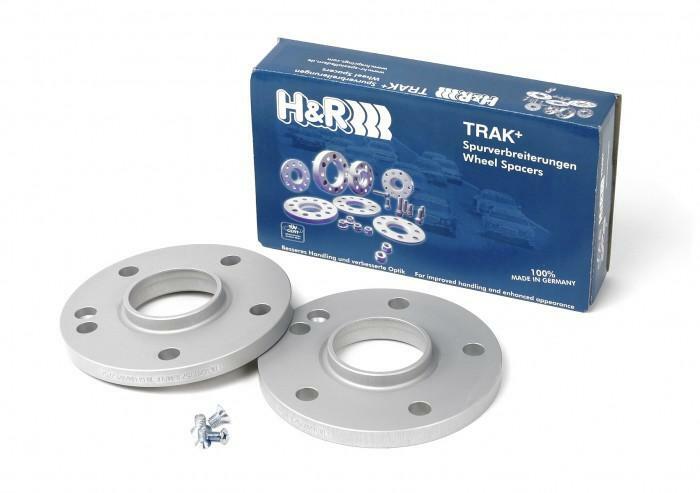 If youve ever seen a sleek, European sedan with that oh-so-low street stance and a bulging wheel / tire combo that fits perfectly in the wheel wells, chances are that car was fitted with H&R TRAK+ Wheel Spacers. TRAK+ Wheel Spacers make your existing tires and wheels appear wider by moving the wheel out from the hub, providing both performance and appearance improvements. Whether you want improved handling, increased safety or simply desire your car to make a statement about your individual style, TRAK+ Wheel Spacers can help you accomplish your goal. Adapt wheels with a different bolt pattern. Available in thicknesses ranging from 20mm to 25mm, H&R TRAK+ Wheel Adapters change a vehicles bolt pattern so that wheels from a different vehicle make or model may be fitted. Similar to H&R TRAK+ DRM Series Wheel Spacers, H&Rs TRAK+ Wheel Adapters are hubcentric spacers and fit to the vehicle hub just as a normal TRAK+ Wheel Spacer would. Once fitted however, H&R TRAK+ Wheel Adapters feature a different bolt pattern on the wheel side of the spacer allowing for non-standard bolt pattern wheel fitment. DR Series spacers fit between the wheel and hub, and require longer wheel bolts (ordered separately). Please verify bolt specifics before ordering (taper or round bolt head and shaft length). It was be great if the year / make / model and full name of part was on the check out page. I originally ordered this part from Summit Racing, but they took 2 weeks just to tell me the part was discontinued. So I was glad to see you had it in stock. Very clean website. Easy to navigate.